Are you planning some DIY projects, but you’re new to it all and worried about making mistakes? 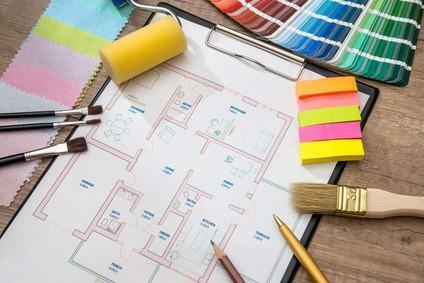 Home Improvement work can be a cost effective way of upgrading your house to increase its overall value, as well as being a fun challenge to make your place exactly how you want it to be. Every area can be worked on in some way or another and it can be tough to choose which projects to tackle first but, with careful preparation and planning, it doesn’t need to be difficult and can be a rewarding experience. There are plenty of online tutorials to inspire and teach you how to do pretty much any task you require, and to help you on your way we have put together this guide of the 5 common home improvement fails you should avoid to ensure you complete your project in a timely and cost-managed way. The most common cause of problems with DIY projects may seem obvious, but simply comes from poor preparation for the task at hand. Before you get the paint out you must make sure the walls are thoroughly cleaned, and surfaces other than those you intend to work on are protected. It is vital that you have thought through the entire project before you begin, make sure you have the appropriate tools, and don’t simply try to use the cheapest supplies you can get. A budget priced paintbrush, for example, may have inferior bristles and leave a poor finish. Easy and quick fixes might help out with your work in the short term, but you will only end up regretting them further down the line, so you should avoid them in the first place entirely. Take wooden doors as an example. During wet weather they can swell and become stuck within the frame, something that can be solved by painting the wood﻿﻿﻿. If you fail to paint over these edges with an oil-based primer, though, it will simply absorb more moisture again and you’ll have to work on it yet again. Simply measuring the area you will be working on and buying the required materials to cover that area will leave you in a tricky position when you reach the end of your project. You must always make sure you have a slight surplus of any materials like paint or wallpaper because things do not always go entirely to plan. You must also make sure that the batch numbers of supplies you buy are the same so there are no color discrepancies, and make sure the store accepts returns if it does turn out you have bought too much. Every task at home has a slight risk associated with it and it is crucial that you take adequate precautions to keep yourself, and anyone else safe, while you are working. It is worth keeping a first aid kit close-by, always keeping watch over power tools that are plugged in, following tool instructions, keeping the area clean, and being aware of your surroundings and any problems that could arise as a result of the work you have planned. It is great that you are pursuing your DIY ambitions, but you must be sure that you only tackle projects that are feasible for someone of your experience. Part of the process of course is learning, so you can research what you are doing thoroughly online before attempting it. Some jobs, though, are simply unrealistic and much better done by a professional. This depends on your own ability, but to ensure the work is done correctly, safely, and finished in a reasonable amount of time- you must be pragmatic about what you take on to do yourself. Home improvement can be a challenging and very rewarding thing to do, but it’s important to make sure it’s done properly otherwise you may find yourself doing far more harm than good. The key to this is research and preparation- to ensure you know the techniques required, and have all of the materials and tools that you need. If this is done you will do great work and be able to fully realize your dreams. If you have any comments, please leave them in the section below. Follow these links for more information, and good luck with your projects!